Nick, 16 Mar 2018You sound like as if images with tons of saturation and oversharpening applied are still "natu... moreBut then again, Samsung is complete opposite when shooting good light shots, than it is when doing low light, oversaturated, and too much oversharpening/contrast. Isnt it? Nick, 16 Mar 2018Again, as I said before, if they are really just "noises", then they shouldn't exhibit any sor... moreI really dont get what you are getting about here. Yes there is sharpening algorithm there, but that is ISO 160, and same is applied at ISO 50 at 1/1s shot. But on those higher ISO ones I really dont know how you can call it on sharpening, all is equally fine tuned noise. And yet, Pixel is considered a top lowlight shooter. P.S. Before anyone comments of extra brightness on Pixel, nearest street light is on on that shot, on Xperia not. Anonymous, 16 Mar 2018S9 wipe the noise but also wipe the details in lowlight, while in daylight the 1.5 aperture ov... moreYou sound like as if images with tons of saturation and oversharpening applied are still "natural" looking. Sky is having a purple tint on XZ2 and I find it much more "artificial" than what Huawei and Samsung do with the colour of the sky. And you should also remember that XZ2 also boosts contrast significantly to hide noises under low-light condition. Kinda funny though, because for last couple of years Galaxy phones had been known for oversaturated and contrasty photos, but now it's completely opposite and produce one of more accurate-looking photos at least in terms of colours. Tann Hauser, 16 Mar 2018I am sorry, but clearly you misunderstand the sharpening artefacts. In those pictures you lin... moreAgain, as I said before, if they are really just "noises", then they shouldn't exhibit any sort of splotchy, uneven zigzag patterns, which unfortunately shows up on (pretty much all) XZ2's photos. They contain a lot of noises, yes, but also a huge amount of sharpening artifacts. You would know this if you had edited RAW image on a smartphone even once (which probably you hadn't, since Sony phones do not support RAW image capturing) - this is not what the pure luminance noise looks like. And as for the part where you said that oversharpening causes light sauces to form multiple layers instead of having smooth transition, that shows up in XZ2's photos as well. It's just that the noise level is so high that you cannot clearly see the "layers" of light, but if you look closely you can tell there are some uneven transition in the colour of light from light sources. Here's another photo (this one is taken with long-exposure) for you so that you can check some obvious sharpening halo around the light sources far away. This one exhibits strong patterns of sharpening on the left side of the image. "And colour noise? You mean chroma noise? It is nonexistant"
Nope, I'm actually talking about colour/chroma noise. This photo contains a lot of colour noises (red and green dots) across the whole image. It's suppressed and reduced so it's not something you can tell unless you zoom in, but it is definitely there once you start getting closer. Nick, 16 Mar 2018Optical image stabilisation definitely DOES help reducing noise, as it allows shutter to open ... moreI am sorry, but clearly you misunderstand the sharpening artefacts. In those pictures you linked I clearly see the noise but not oversharpening. ....around every light source there can be seen layers, not smooth transition, that is oversharpening artefact. And colour noise? You mean chroma noise? 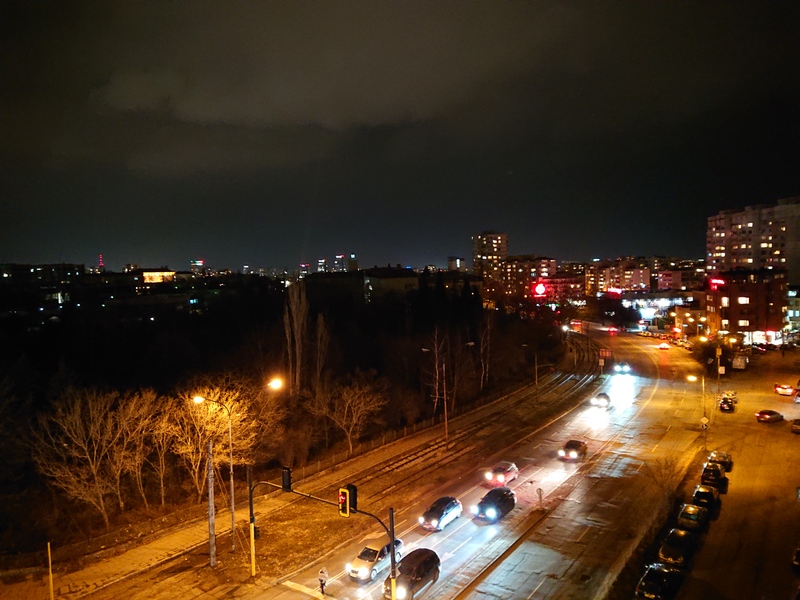 It is nonexistant, I can see only high ISO noise around cars and lights. Maybe you are thinking at colour fringing? Both have those, in same areas. Nick, 16 Mar 2018Optical image stabilisation definitely DOES help reducing noise, as it allows shutter to open ... moreS9 wipe the noise but also wipe the details in lowlight, while in daylight the 1.5 aperture overexpose causing some color fadeout. On the other hand, Mate 10 Pro boost the contrast but this will causing certain scene and object look unnaturally this causing the image looks artificial. iphone wipe the image looks more cozy and still punchy color but doesn't like Samsung.This time XZ2 much better overall because don't wipe details don't artificial with much colors show, it much close to reality too. Tann Hauser, 16 Mar 2018I am pretty certain OIS would have no to minimum advantage for Xperia to be even better in low... moreSmartphones can use extremely fast electronic shutter to restrict the amount of light coming into a sensor, so wider aperture isn't really an issue here. And I'm pretty sure even with brighter (hence softer) lens, sheer resolution count of the high-res sensor which Sony uses can make up for it by a large margin. Tann Hauser, 16 Mar 2018Image quality is excellent. You must be refering to less noise reduction here. But it would... moreOptical image stabilisation definitely DOES help reducing noise, as it allows shutter to open for a longer period of time, therefore lower ISO can be used to gain the same exposure. 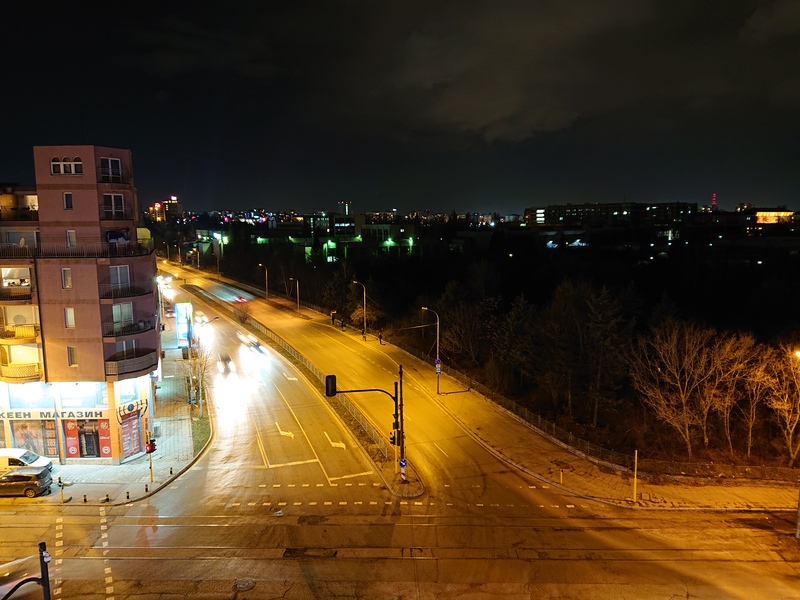 "Too much noise reduction as some other do it, looses detail and sharpness, and produces less quality image"
The most of "noise" you're seeing on XZ2's nighttime photos are caused by oversharpening. Take a look at those photos, for example. Instead of being finely grained, noises are more like blobs and you can see a lot of sharpening artifacts around cars and roads in the first pic. The second picture has another problem - You can clearly tell that the whole thing is covered by quite a lot of colour noise, which all recent flagship smartphones handle perfectly. They are especially visible around moving objects such as front lights of cars. "And Daylight ones are top, dont even have to discuss those"
With tons of oversharpening artifacts across frame and purplish sky, I wouldn't say it's on "top" though it is indeed one of better daylight shooters. Other phones like Mate 10 Pro and S9 have less details but clearly handles noise better than XZ2 does. nice, 15 Mar 2018 The only thing this phone lack is headphone jack. Everything else is game changing and almos... moreAre you blind? Famed hanging? What? The fattest phone on Earth? The ff camera without auto focus? Courage? What is wrong with you? Go check your eyes. This is phone which will be forgotten as soon as it arrives. Shui8, 16 Mar 2018Check on picture comparison tools, even without OIS, XZ2 provide very good quality results in ... moreI am pretty certain OIS would have no to minimum advantage for Xperia to be even better in lowlight photo here, but wider apperture. Then again wider apperture has its downsides of focal point range, and if too much, gets too bright for decent good light photography. Anonymous, 16 Mar 2018Please note that studio shots are taken with the phones mounted on tripods and do not reflect ... moreImage quality is excellent. You must be refering to less noise reduction here. But it would loose great detail and texture that way. Too much noise reduction as some other do it, looses detail and sharpness, and produces less quality image, so Sony did the other way around here. And no, OIS wouldnt help in keeping the noise lower here, but wider apperture to keep the ISO lower, and thus less noise to reduce. Tho even the noise levels are good and barely noticable here. Due to higher mpx camera. Indeed, produces great low light shots, IMO better than some big competitors. And Daylight ones are top, dont even have to discuss those. AnonD-647882, 16 Mar 2018https://www.gsmarena.com/piccmp.php3?idType=5&idPhone1=8966&idPhone2=9081&idPhone3... morePlease note that studio shots are taken with the phones mounted on tripods and do not reflect actual handheld situations. 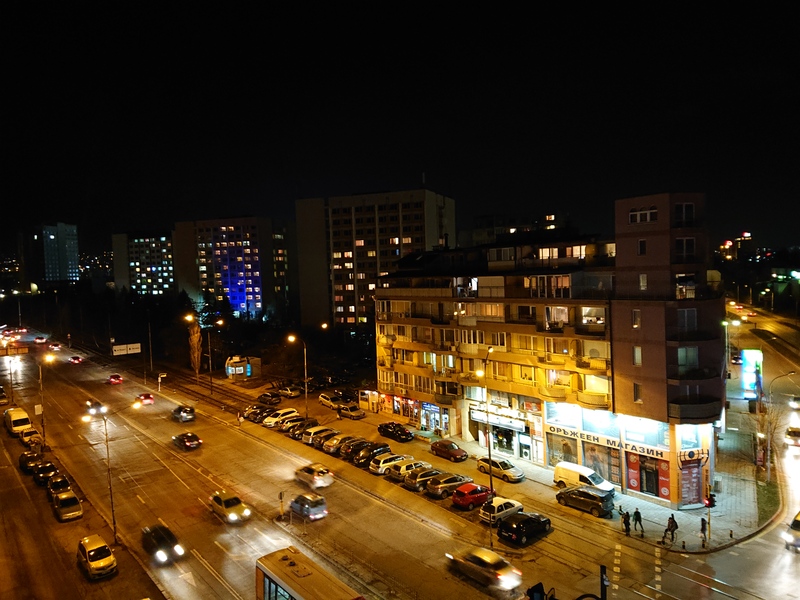 The XZ2 is able to detect the presence of a tripod in auto mode and use a slower shutter speed, and hence lower ISO, to improve the image quality in lowlight. In handheld conditions, it will resort to using higher ISO, which reduces image quality. xXENDER FREAKXx, 14 Mar 2018Lol sarcasm fam???Nope. This is true. I due love it. PeterThePanda, 16 Mar 2018No headphone jack = No buy. Not to mention excessively thicc while having an average battery, ... moreCheck on picture comparison tools, even without OIS, XZ2 provide very good quality results in low light photography, simply the best non OIS phone. This time Sony do it right. Yeah I know your money to be worth it if OIS added. Imagine if Sony put OIS in next Xperia phone with current image algorithm, it will be excellent! PeterThePanda, 16 Mar 2018No headphone jack = No buy. Not to mention excessively thicc while having an average battery, ... moreI think with XZ2 sony has made an improvement, previous sony phone are like 2002 style enginering, using old school cable solution for antennas, and plastic band for metal body design, but now they have use better antennas solution, i dont know about internal construction, is it still the same or not, but i think its it doesnt change verymuch.